ABSTRACT: The St. Peter’s Pool section, that outcrops at Delimara Peninsula (south-eastern part of Malta Island), belongs to the Upper Globigerina Limestone, the youngest member of the Globigerina Limestone formation. 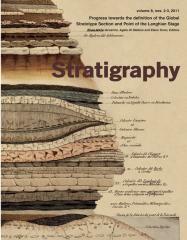 The high resolution integrated study performed on it revealed the great potentiality of this section for a further development of the Mediterranean Langhian biostratigraphy and for a better understanding of the geology of the Maltese Archipelago. Calcareous plankton quantitative analyses allowed the definition of several bioevents with a great potential for biostratigraphic studies. Some of them are already well-known, such as the Helicosphera ampliaperta LCO (Last Common Occurrence), the paracme interval of Sphenolithus heteromorphus and the Acmea interval of Paragloborotalia siakensis, while the potential of Paragloborotalia bella LCO and the P. siakensis Acme0 are documented for the first time in the Mediterranean area. Other bioevents were recognized through qualitative analyses, such as the Paragloborotalia acrostoma LO (Last Occurrence), the Globigerinoides sicanus FO (First Occurrence), the Paragloborotalia birnageae LO, the Globorotalia mariae mariae FO and the P. bella LO. The St. Peter’s Pool section is characterized by a continuous sedimentation from the upper part of MMi3 Zone to the lower part of MMi4c Subzone of planktonic foraminiferal zonation of Di Stefano et al. (2008) and from the uppermost part of MNN4a Zone to the lower part of MNN5a Zone of calcareous nannofossil zonation (Di Stefano et al. 2008). The magnetostratigraphic interpretation, though rather uncertain, enabled us to identify the C5Cn–C5Br interval. On the basis of the bio-magnetostratigraphic events recognized in the St. Peter’s Pools section, we were able: i) to date the base of the Upper Globigerina Limestone member outcropping in the Delimara Peninsula; ii) to obtain the Burdigalian age for the Upper Globigerina Limestone member, that is the oldest ever recognized in the Maltese Archipelago and iii) to propose this section as potential candidate for the definition of the Langhian GSSP (Global Stratotype Section and Point), thanks to the high quality of calcareous plankton content, the deep paleoenvironmental setting, the suitability for future cyclostratigraphic studies and, finally, the easy accessibility to the outcrops.